If you are looking to improve your gum health, the Philips Sonicare ProtectiveClean 5100 rechargeable electric toothbrush might be one of the products you are considering to get yourself. However, one concern stands out; is it really worth the investment? The review below will give you every bit of information you need to have about the Sonicare ProtectiveClean 5100 electric toothbrush and hopefully make it easier for you to make a well-versed decision before you buy one for yourself. Why Philips Sonicare ProtectiveClean 5100? This electric toothbrush is fashioned and designed to improve the health of your gum for up to 100% more than your regular manual toothbrush and more so, gently. This beauty is densely packed with high-quality bristles that give you a gentle brushing experience along your gumline to effectively do away with plaque. It has a curved power tip which makes it easier for you to brush the teeth at the back of your mouth. 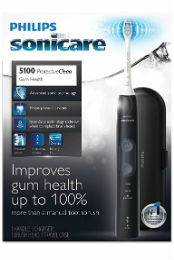 The Philips Sonicare ProtectiveClean has three modes of brushing, namely; clean, white and gum care. This is somewhat standard for most electric toothbrushes within this price range. The three brushing modes allow you to customize your brushing as per your needs. On paper, the clean mode is meant for superior cleaning and the white mode enables you to remove discolorations such as coffee stains from the surface of your teeth. The gum care mode is built to improve the health of your gums by adding an extra minute to your brushing with reduced power. Too much pressure while brushing is certainly not good for your gums especially if you have sensitive gums. This, however, is not the case with the Philips Sonicare ProtectiveClean 5100. This electric toothbrush comes equipped with a sensitivity sensor that makes a pulsing sound whenever you are applying too much pressure. This is how you know you are pressing a bit too hard. All toothbrushes whether manual or electric wear out over time. The bristles get frayed and lose their ability to clean your teeth thoroughly. In addition, bristles are the primary choice of home for a variety of germs and bacteria. ProtectiveClean 5100 is intelligent enough to let you know when to change the brush head. The Sonicare BrushSync technology tracks two measurement values in order to determine if the brush head is worn out. First, it tracks the length of time you have been using the brush head, and second, it tracks the level of hardness that it has been applied over time. A light on your handle and a beep sound will let you know when you ought to replace the brush head. This is one good thing as you will be sure that your brush head is performing optimally and effectively as such. Philips Sonicare ProactiveClean 5100 also comes with a SmarTimer which lets you know that you have indeed brushed your teeth for the recommended two minutes. The QuadPacer is a feature of this electric brush that put you on the know on the right amount of time spent brushing one part of your mouth. The handle is designed to resist water, toothpaste, and even saliva. However, it is not advisable to immerse it in water or use it while in the shower for that matter. After brushing your teeth, a quick rinse is enough. The handle which is made out of plastic is slim offering you a comfortable grip for an amazing brushing experience. The design of the handle is round and offers a smooth feel upon holding it unlike other electric toothbrushes in the market that have sharp edges. It has got two conspicuous buttons, one as the power button and the other one is used to change the different modes of brushing as per your preference. In the handle, there is a motor which offers 62,000 movements per minute. This will with no doubt leave your teeth as white as snow and fresh as such. The Philips Sonicare ProtectiveClean 5100 handle comes in a variety of colors from black, grey, white and even pink. One exciting thing about the Philips Sonicare ProtectiveClean 5100 is the battery life. Upon full charge, this splendid electric toothbrush will offer you 2 weeks of brushing without having to recharge it that is if you are not the type that goes overboard brushing four to five times a day.